Am I not too old for this ? I heard that gymnastics is bad for your joints…. This last statement very often comes from people who will brag about bench pressing 300 pounds yet are not able to put a shirt on without complaining about shoulder pain. What is the point in 400-pound back squat if your knees ache every time you sit up off the couch ? Of course, there’s nothing wrong with bench pressing or barbell squatting as long as your joints are ready for these lifts. If you are a believer of the fitness magazine headlines read “4-minute abs,” “how to lose 20 pounds in 15 days,” or ” how to gain 10 kilos of lean muscles in a month,” gymnastics is not for you. However, if you are ready to change your view, hide your ego and confront the reality, one day you have a big chance to stand out from the crowd and become extraordinary. Are You Too Old To Start ? Is Gymnastics Only For Young ? Even if you are 18 years old and you think of gymnastics in terms of Olympics it is most likely too late for you. But it’s never too late to get stronger, more powerful and more flexible than most people around you. Training might require a different approach in adults and the results might not come as quickly as for those in their teens, but you are never too old to start feeling younger. 86-Year Old Johanna Quaas is a living proof that not only you can train gymnastics at an older age, but you can also stay fit enough to compete and win. 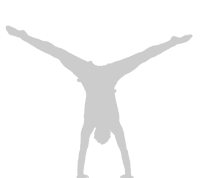 Gymnastics training does a fantastic job for your mobility and joint strength helping at the same time heal old nagging aches and pains in your shoulders, elbows, knees, or wrists. This very popular statement very often comes from your local bodybuilding gym or from people that literally have never had anything to do with gymnastics strength and conditioning training. I bet you heard many times that locking your elbows while doing dips is bad for your elbows or doing pull-ups from the full hang is going to hurt your shoulders. Well, people very often like to justify their weaknesses or lack of mobility with statements like these. If you’ve never driven a car before and you are trying to do it the first time ever on a motorway, more than likely you will get seriously hurt. 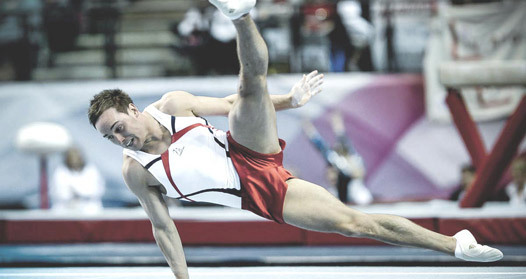 Gymnastic conditioning involves a lot of ligament and tendon strength. The metabolic rate of connective tissue (tendons and ligaments) is much slower to that of muscular tissue. Tendons and ligaments improve their strength and flexibility at 1/10th the speed of muscular tissue, they also heal TEN times slower. All these simply mean that if you try to overload weakened unconditioned ligaments and tendons that very often lack the flexibility at the same time, you can end up with a serious injury. The problem is not gymnastics but lack of training knowledge and very often a big ego of people attempting gymnastics exercises. Apart from being one of the most explosive and most coordinated athletes in the world, pound for pound gymnasts stand among the strongest with unrivalled functional and static strength abilities. While other athletes will not be able to perform the easiest strength movements trained in gymnastics, gymnasts often come close or even beat some of the athletes at their own game. It is not unheard of gymnasts bench pressing or squatting more than two times their body weight without even touching Olympic barbell before. Smart training progression can lead you to strength feats like planche, front lever, manna, and many other skills which are well within your reach and can be trained even at home. Mobility is something that most of us forget to prioritize despite the fact that we have managed to learn how to lose it over time. We are all born with the ability to move our joints within a full range of motion. Just spend a couple of minutes with an active child and see how easily they are able to squat without restrictions or travel across the monkey bars on the playground while demonstrating full shoulder flexion and mobility in their upper backs. As we get older we tend to lose these and other abilities to be mobile. And we don’t lose it just because we get older. Sedentary lifestyle, inappropriate training technique, overemphasizing one movement over another in certain activities, or simply forgetting to use our joints to their full abilities…These bad habits will create imbalance and encourage our bad posture. Gymnastics conditioning does not only make you strong, but it also makes a fantastic job at helping to promote and balance mobility which will result in improved joint health. Ability to quickly change the direction of the body while handling the football, staying dry while trying to balance across the tree that is the only way to get on the other side of the river… Specific gymnastics drills can add and improve functional activities in your everyday life. Although the primary training objective behind the gymnastics training program is functionality and performance, a very pleasant side effect of working your body in this fashion is building and maintaining lean muscles. Muscular shoulders, chiselled chests, six packs…It is not a secret that people all over the world are drawn to gymnastics physique. Balance, flexibility, functional strength…There’s simply not a better tool to develop these abilities and adapt it to your chosen athletic activity. In eastern Europe, nearly all top Athletes can put their superiority down to gymnastics strength and conditioning implemented in their programs right from early days of training. You will rarely see an Olympic Wrestler or Weight-Lifter not being able to show off with a back-flip or do multiple muscle-ups. The great thing about bodyweight training is that you are not going to need expensive equipment to build your physique and functional strength. Floor Space, Pull Up Bar, Gymnastics Rings, Handstand Blocks, Parallettes or Parallel Bars, Elastic Bands.These will be all you need to train at home. You can even buy Stall Bars and install them in your house. Obviously, if you think of a professional career for your kid, your local gymnastics club should have all you need.